I enjoyed this book. I think I enjoyed it more because it was written in the third person. Therefore it wasn't really a given, as most first person narrated books tend to be, that the protagonist survives. 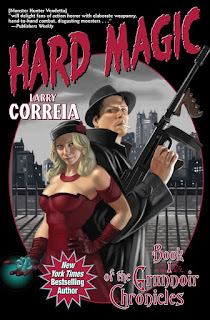 In some aspects Hard Magic is miles apart from Correia's Monster Hunter books and in others it's pretty similar. A hero of large size and rough demeanor with a complicated family past joins a band of not so lovable losers, misfits and outright criminals who are nonetheless tasked to save the world. This story also put me in mind of the X-Men Professor X: Magneto conflict as well as the classic Doc Savage pulp novels. This book took me a little longer to read than usual. 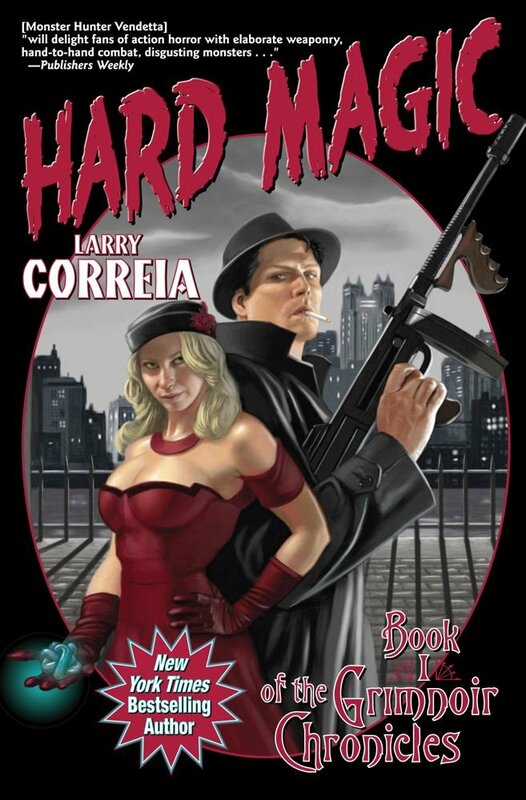 At 600 pages, Hard Magic isn't a quick read. But mostly it took me longer to read because my lunch hour seems to keep shrinking. In a perfect world I would have finished this book in about two weeks. Healers: Their name is self explanatory. Short of immediately fatal wounds or certain chronic diseases/conditions they can heal anyone. Brutes: When they so desire they possess incredible rage and inhuman strength. Any ordnance short of high powered rifle bullets bounces off of them. They can punch through concrete walls and toss automobiles without breaking a sweat. Mouths: They can convince anyone to do or believe anything just by speaking to them. Fades: They can alter their density and walk through solid objects. Torches: They can control fire. Heavies: They can relax or increase gravity's strength on themselves, items around them, other people, or sections of the planet. They can also redirect gravity's direction. Sideways or up can become down. Readers: They can communicate telepathically and can read anyone's thoughts, willingly or not. Summoners: They can call and command supernatural beings. Pale Horse: The opposite of a Healer. They are able to radically increase the aging process or give anyone a disease. 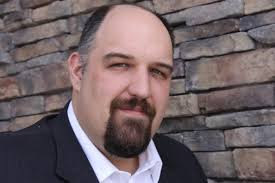 Jake Sullivan is a man who has just been paroled from prison from manslaughter. He prevented (with extreme prejudice) a southern sheriff and associates from lynching a black child who was also an Active. A man of impressive height and size, Jake is also a war hero and one of the most talented Heavies around. Although people think he's dumb because of his size and talent, he's actually working on a Unified Field Theory that would explain how all of the powers fit together. Jake is doing that in his spare time when he's not working for the FBI. As part of his parole Jake agreed to help hunt down five criminal Actives. The problem is that Director Hoover doesn't like Actives. Hoover doesn't think he needs to keep his word to Jake. When Hoover sends Jake after Jake's old flame Delilah, Jake is suspicious. The Delilah he knew wouldn't have committed the crimes the FBI says she did. Delilah is a Brute. A very pretty one to be sure but a Brute all the same. In California, an adopted teen, Faye, can only watch in horror as her grandfather is murdered by strange men searching for some part of a machine. Faye and her adoptive grandfather are both Travelers. Her grandfather gives her the part and sends her away. The world's richest man, Cornelius Gould Stuyvesant, has a burning resentment against someone, so much so that he's willing to pay a Pale Horse to curse the man with various slow wasting diseases. The Pale Horse doesn't want money, but he does want a favor. All of these story lines slowly come together. Jake learns that he's not the only one who has been searching for the reasons why people suddenly have powers, where these powers come from and how they all fit together. There are two opposing organizations. One group wants Actives and Normals to live together in peace with neither attempting to enslave or exterminate the other. The second, well they say lions don't need to explain themselves to sheep. The strong should rule the weak. Actives are strong so case closed. This philosophy happens to mesh perfectly with the ruling class perspective of a country that became a key WW2 belligerent. Most of the leaders of the second organization come from that country. This book was fun. It is first in a series. If you enjoy action books with a bit of magic, humor, and detective work included you could do worse than to read this book. It works the same side of the street as the Harry Dresden stories. I don't remember much from college physics but I do remember that time slows down in areas where gravity is strongest. It would have been interesting to delve more into how science was being rearranged by exercise of these powers, especially the power to warp gravity.